Thanks to Renn Hubbuck for this guest post on the newly refurbished Cardiff M.A.D.E gallery and their opening festival ‘Cosi’. A new gallery is opening in Cardiff this weekend which aims to bring art into the community and provide more opportunities to artists. Cardiff M.A.D.E. is more than just a gallery space. The directors of the Community Interest Company, Zoë Gingell, a local artist, and Joshua Leeson, an interior furniture designer, say they want to go ‘beyond just art and design’. Their intention is to ‘create a platform’ for artists to showcase their work as well as make art more ‘accessible and approachable’ to the public. An ‘Affordable Art Wall’ has been set up, the first of which will be unveiled at the opening of the gallery on the 7th December, then be sold to the public at a maximum price of £150. Formerly known as Milkwood, an exhibition space and shop, M.A.D.E. offers Cardiff based artists opportunities to allow their work to be seen and sold, and also supplies a place for artists to develop their practice. Residencies, in the basement of the building, will provide a free place to work for six weeks with a guaranteed exhibition at the end of the residency. This downstairs area will also hold showcase evenings called ‘Basement Sessions’ where live performance, music, spoken word, film and visual arts can take place, giving more people the chance to present their work. A membership scheme is also in development, where online support will be provided through a website showcase and online shop; practitioners will get help to create their own page promoting their practice which will be linked up the main site. This gives people a starting point and creates a strong network for artists, designers and makers. The space also has a café and deli which has locally sourced and produced food and drink on sale, including bread, coffee, cheese, juices and milk. The opening is on the 7th December, the same day as ‘Small Business Saturday’, which was set up to encourage the public to support local business. 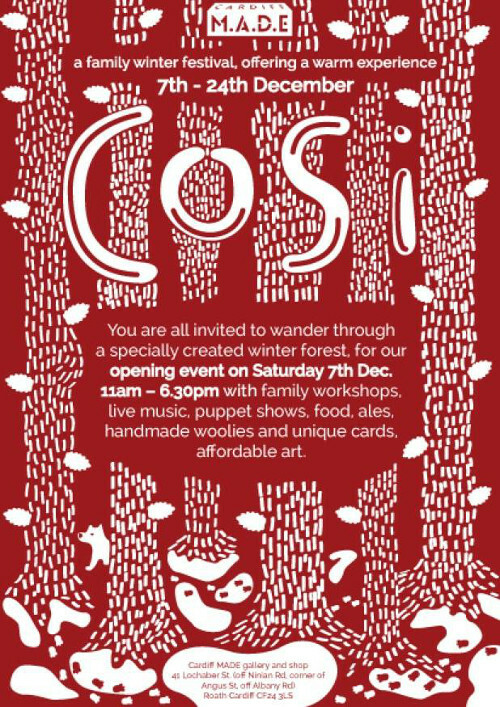 This will kick off a family festival called ‘Cosi’ and has events throughout the day, including a puppet show, workshops and live music. Starting at 11am and continuing until 6.30 pm, the gallery will be transformed into a winter forest with ‘alternative’ trees that are available to buy, and that were made by Cardiff students. It also features original Christmas cards designed by Cardiff Met illustration students. Food and drink will also be on sale, such as soups, real chai, local breads, artisan mince pies, ales and mulled wine. The exhibition continues until Christmas Eve and is open daily. This event can be enjoyed by all ages and there is something for everyone. 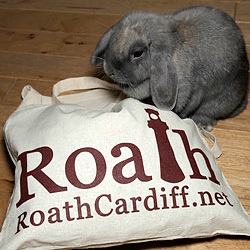 The gallery is situated on the corner of Lochaber Street and Angus Street, Roath. To find out more information on Cardiff M.A.D.E. you can find them on Facebook, where you will also find details of the Cosi Festival, or drop them an email.